Notes: Alternate universe. Post-CL. Disregards epilogues. Different living arrangements. Notes: Considered AU because it makes vague mention of characters whose permissions we don't own. No liberties were intended to be taken. Notes: Takes place after the close of CL, but discounts Rhiannon's 2nd epilogue. Notes: Takes place after City Limits closed. Discounts character epilogues. 1) Alternate Universe (AU) or Canon? Guidelines: You may not use other writers' characters without permission. If you'd like to make loose mention of them, that's fine, but consider labeling it 'AU' so that you don't inadvertantly control their characters. Please play fair and be kind (to other writers and their characters). Most importantly, remember that this is simply a way to reconnect with characters or settings you miss, explore things there weren't part of the games, and have fun. 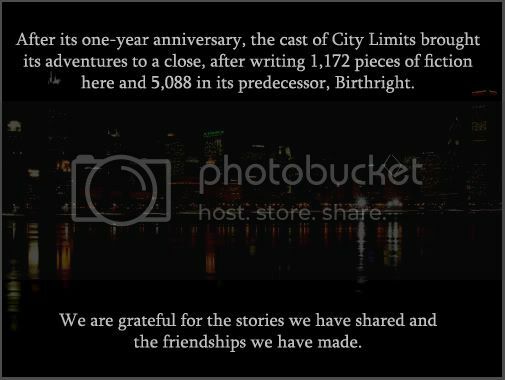 Nothing posted here is meant to subtract from the meaningful experiences our characters and writers shared in Birthright and City Limits. Need a community invite for a FORMER character (not new) of Birthright or City Limits? Contact us at rpgbirthright@yahoo.com! You are still welcome to use NPCs! Maya Lee Tropiano, Rhiannon and Joseph's daughter, was written by our dear love, Kate.